Slide boards are a training tool used predominately by ice skaters, but there they are great training tools for inline skaters, also. Known in the fitness world as lateral slide trainers, this kind of equipment very effectively works the hip and inner thigh muscles in the legs. Hockey skaters also use slide boards for off-ice stick handling training. Speed skaters on ice and inline use it for polishing technique and building power. The main drawback to the slide board is typically the cost. 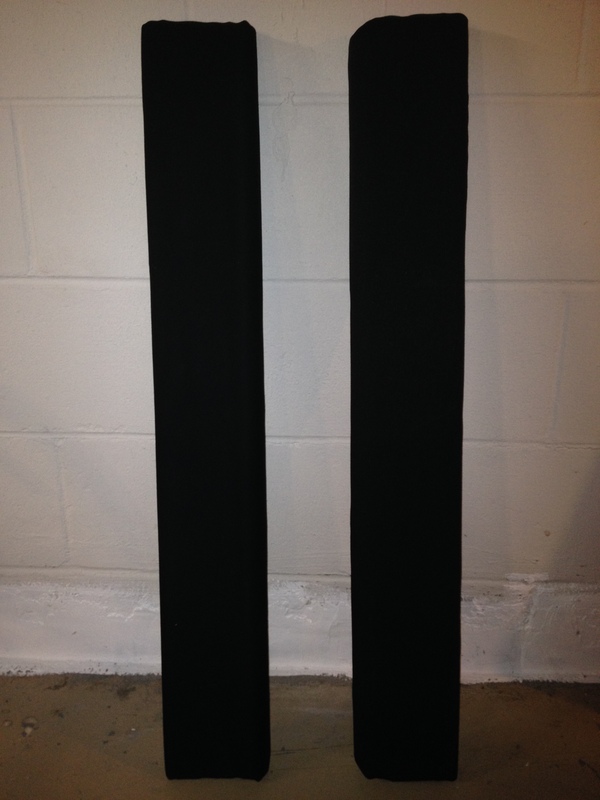 You can find slide boards geared towards hockey players on Amazon for between $200 and $300. Last year, I acquired a slide board from Amazon, but it developed a big problem. The board wasn’t made for more powerful speed skaters. The guy who makes the board told me as much over the telephone. The cheaper boards are priced in the $150 range, some of them even lower. However, most of these boards are built to be portable, made out of fabric like materials or other materials that roll up to be portable. 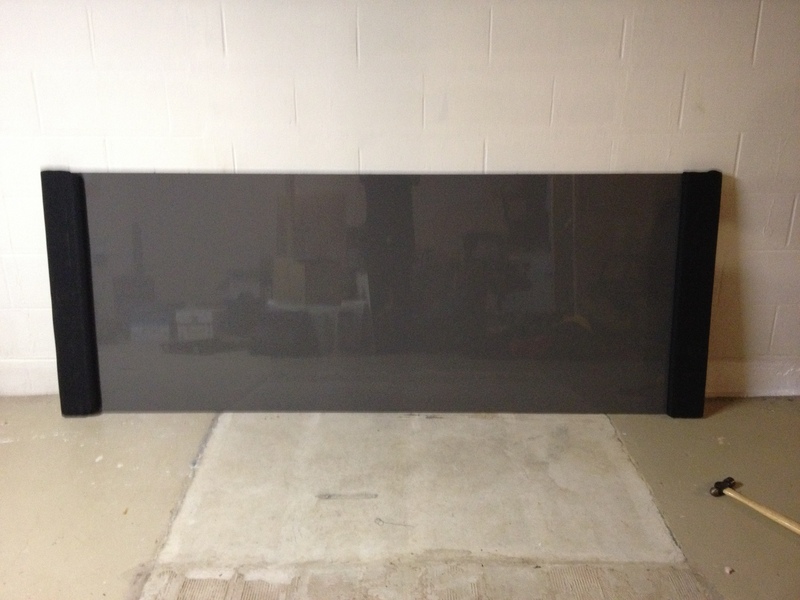 On the opposite end of the spectrum, there are very high-end slide boards that are a single piece, generally are not portable, and are made for world class gyms. These boards range in price from $300 to $600. You also need to nearly double the price to get them shipped. After destroying my slide board earlier this year, I went on a hunt for a suitable replacement. I wanted to make sure a replacement was not cost prohibitive, which, after my initial research, ruled out commercially available options. 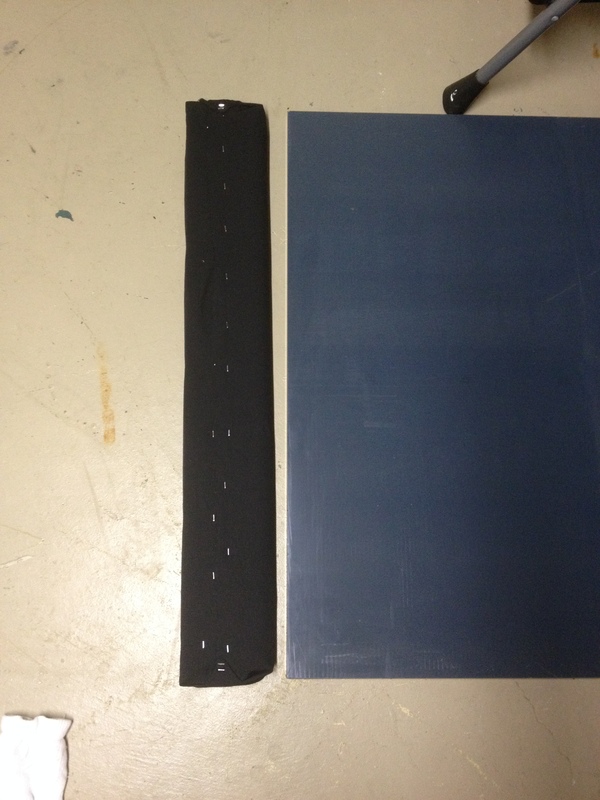 After some additional internet investigation, I came across Kevin Jagger’s instructions for building a slide board on LongTrackLongShot.com. 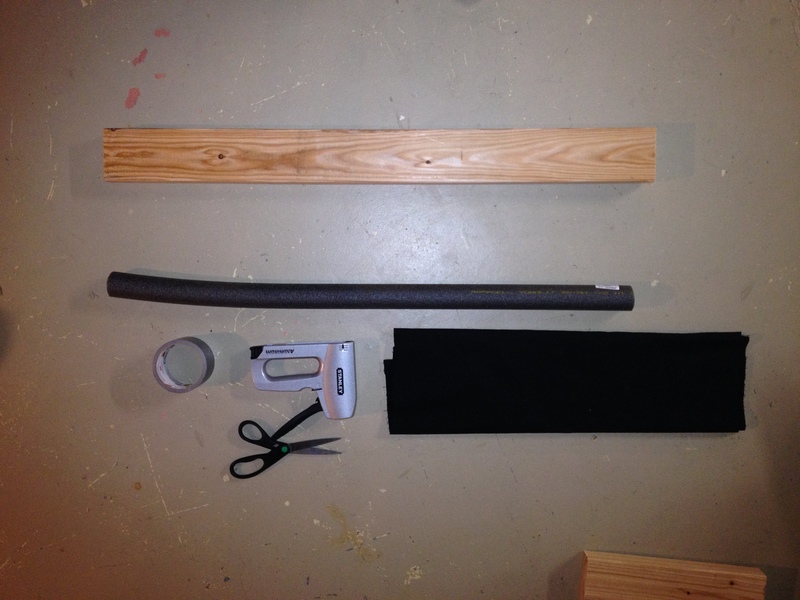 This was the general starting point for my design, and I opted to focus on finding suitable materials. My budget goal was $50. 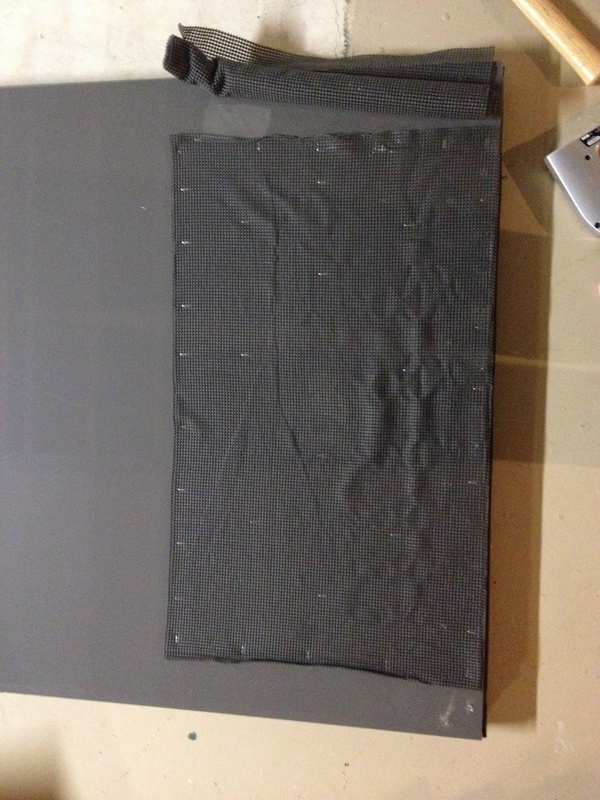 Knowing that the most important, and potentially most expensive, part of the board would be the sliding surface, I was very careful about choosing the material. 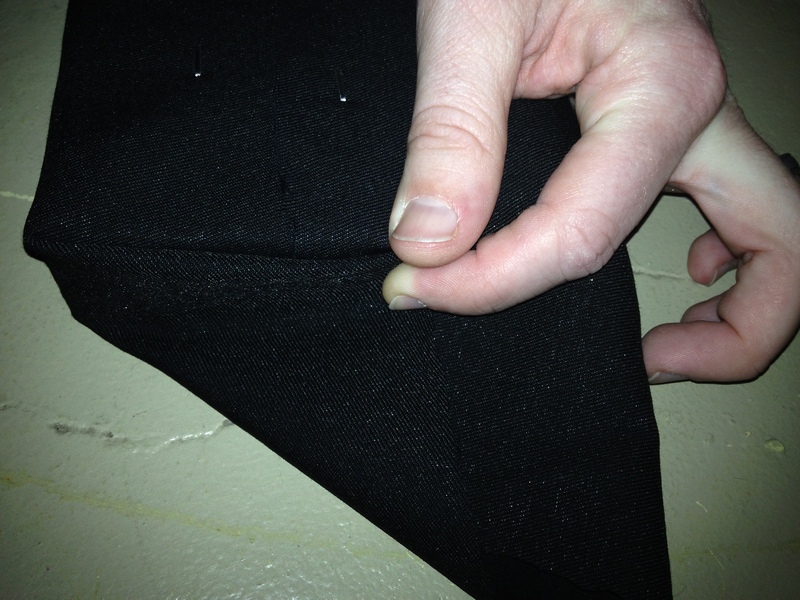 I hunted for a supplier, but wasn’t able to find anything suitable or geographically reasonable for the 8 foot by 2 foot sheet of material I needed for the project. However, earlier this year, my wife and I bought a house for our little family, which means we made several trips to Ikea. 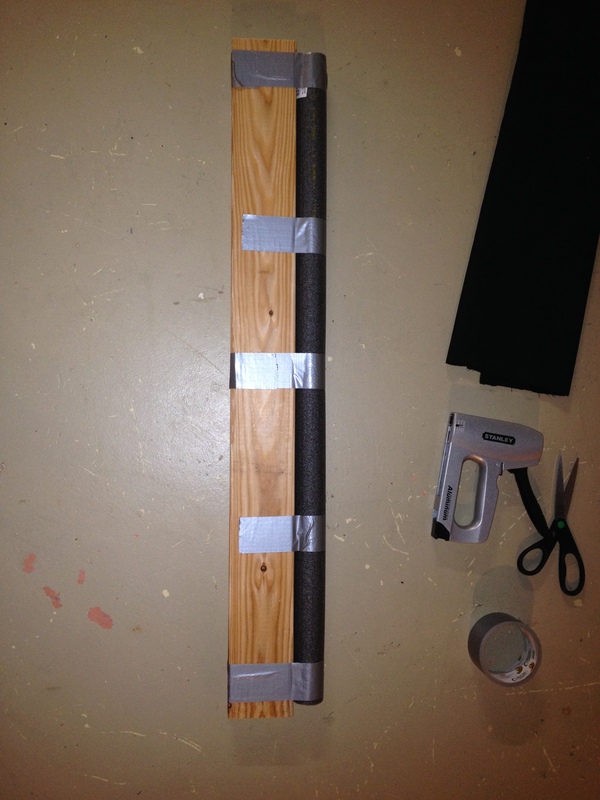 I learned from another friend who skates that you can get good sliding surfaces for slide boards for reasonable prices from the As-Is or “Handy Person’s Corner” at Ikea stores. We have all seen those shiny looking storage units sold at Ikea. 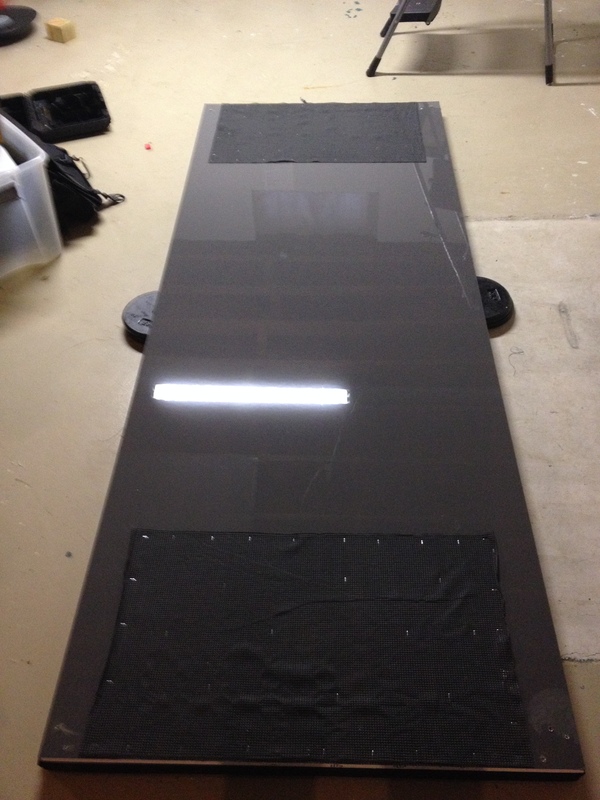 It turns out the doors make pretty good surfaces for slide board building. I picked up an 8 foot by 3 foot sheet of this door material, which appears to be a form of coated and compressed laminate particle board, for $10 in the As-Is section of the store. While the purchase required a harrowing 60 mile ride home through wind and rain with the board strapped to the roof of our car, and it made noise like an airplane engine, it proved to be a great find and became the base for the project. 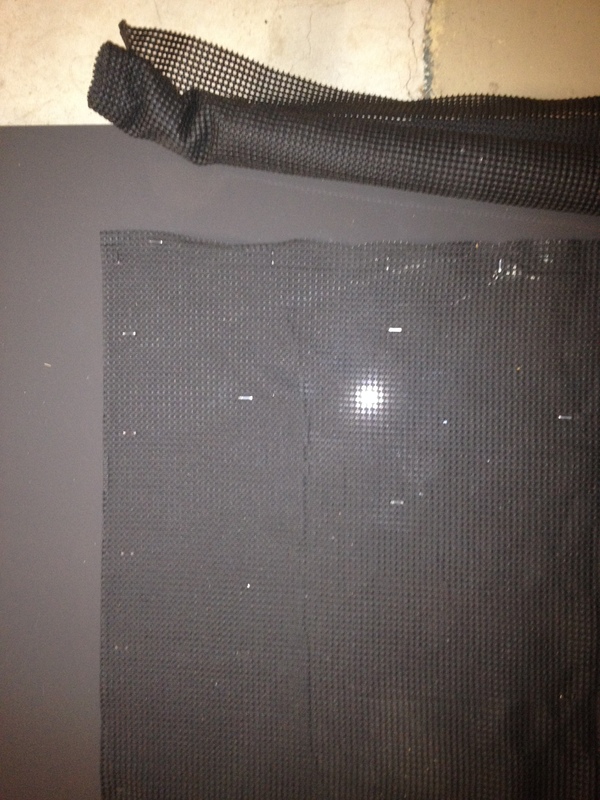 Starting with the sheet for the surface, the next step was to make end-stops. 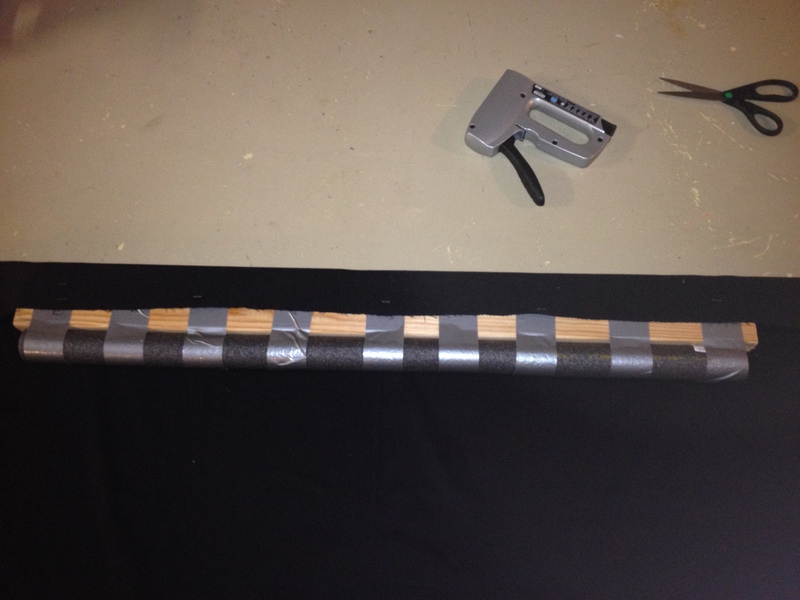 The end-stops are made from 2×4, foam pipe insulation, duct tape, and light weight black denim. the 2×4 is 3 feet long, in this instance, to match the width of the board. 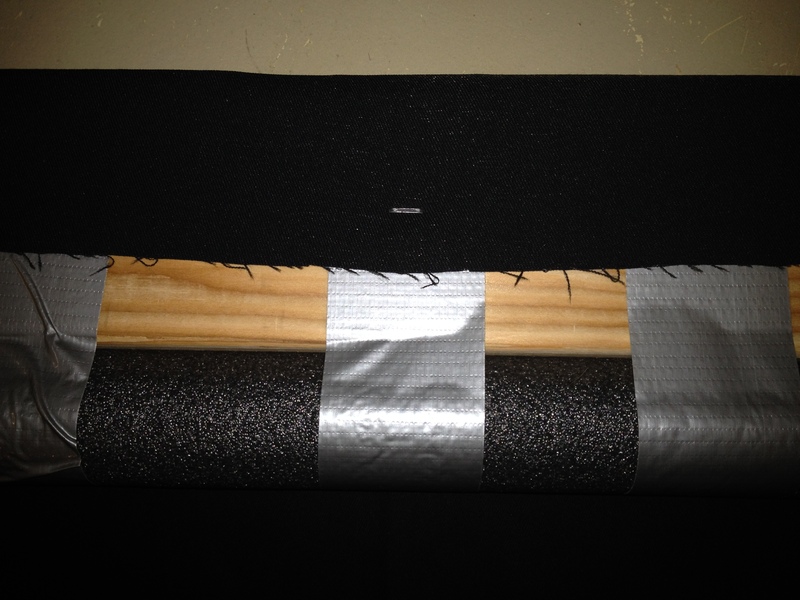 I started off by using the duct tape to attach the foam insulation to the 2×4. 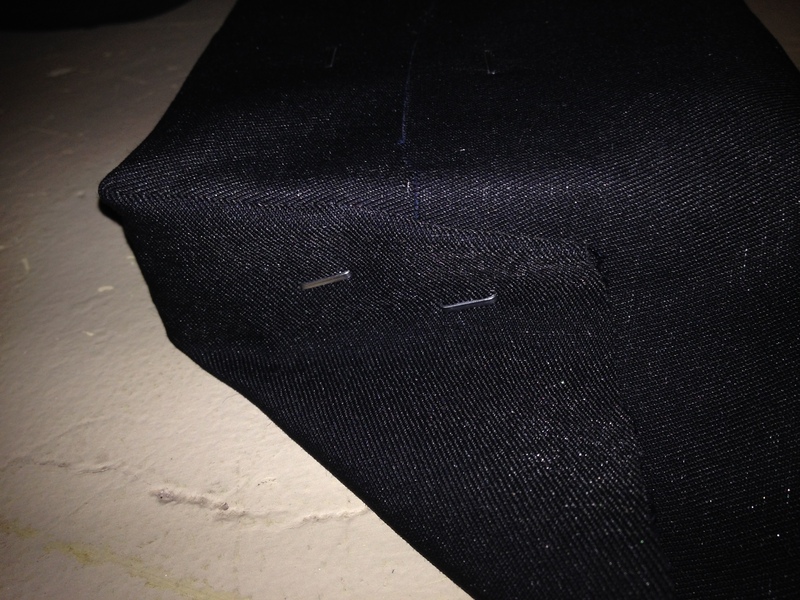 I then cut the denim fabric to length so I could use it to wrap the end stop, with the denim being stapled to the 2×4 to hold it in place. 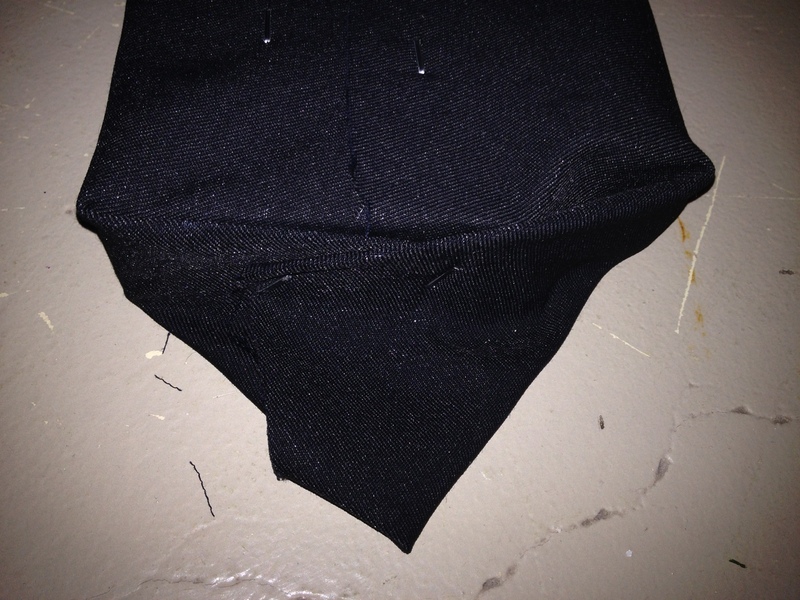 I wrapped the denim in a manner similar to wrapping a box with wrapping paper and also secured it with the staple gun. You can see from the ends that one of my sections of pipe insulation wasn’t the full three feet of the 2×4. This hasn’t proven to be a problem during use, and had more to do with poor measurements in the packaging and reduced length after cutting. Once you get this assembly completed, you have two reasonably attractive end stops. The next step is to attach the end stops to the sliding surface. 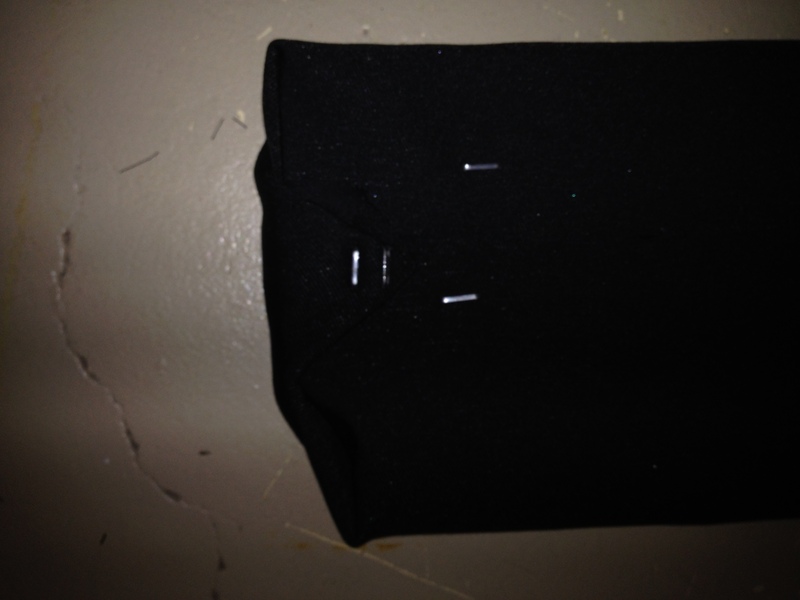 I did a lot of research, and my design ideas went through several iterations, because I knew that the ends tops needed to be able to handle a lot of abuse. Generally, these stops will have to withstand upwards of 300 pounds of lateral pressure against a mounting that is perpendicular to the direction of force. Since I had a bad experience with my last board, I wanted to make sure that this board would last a long time. My original plan was to use four 2 inch long, half inch to inch thick, flat headed lag bolts that would attach to the end stops through the bottom of the board. 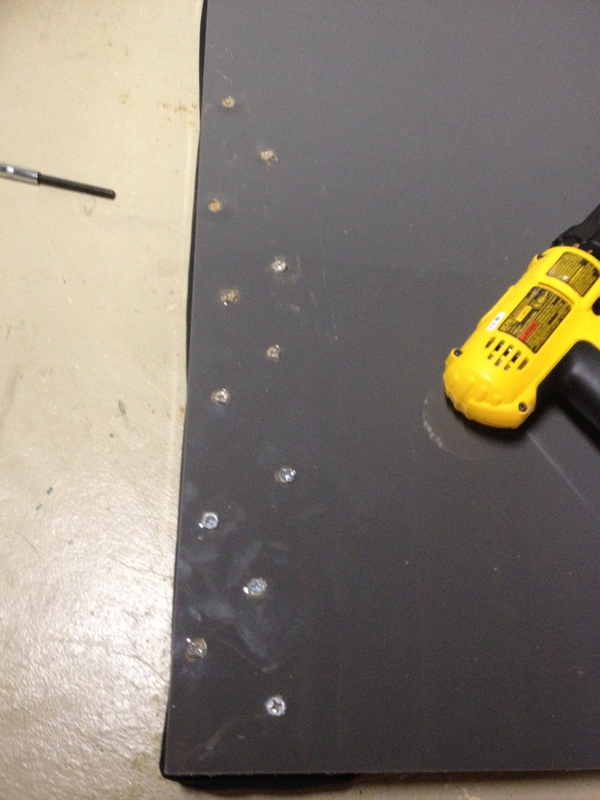 I planned to countersink the space for the nuts on top, drilling the countersink hole large enough to hold a washer. This would, in theory, provide more than enough structural support to withstand the push force exerted on the end stop. Ideally, it also would have meant the entire project would have been reasonably easy to disassemble. However, after speaking with one of the hardware guys at Home Depot, He indicated that two and a half inch wood screws would work just as well. This option ended up being cheaper, and has so far matched the expected performance. 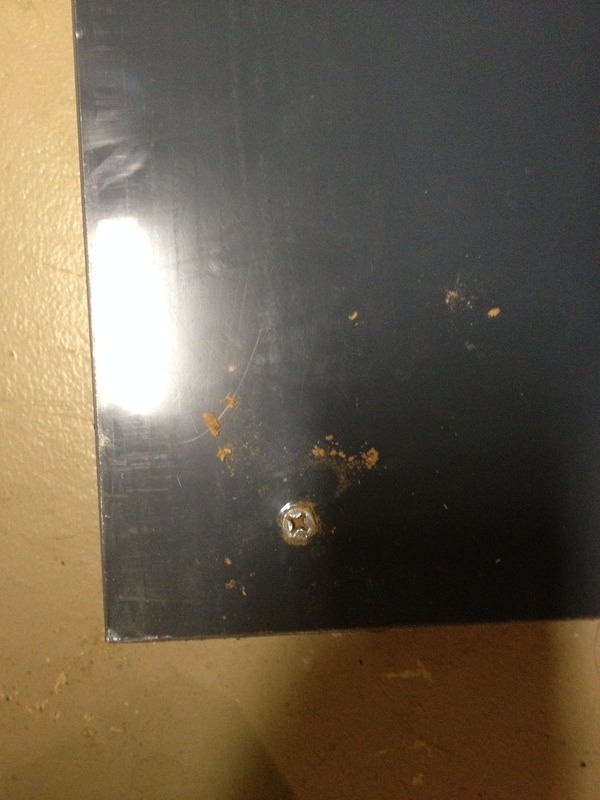 I used 12 gauge wood screws to be sure. 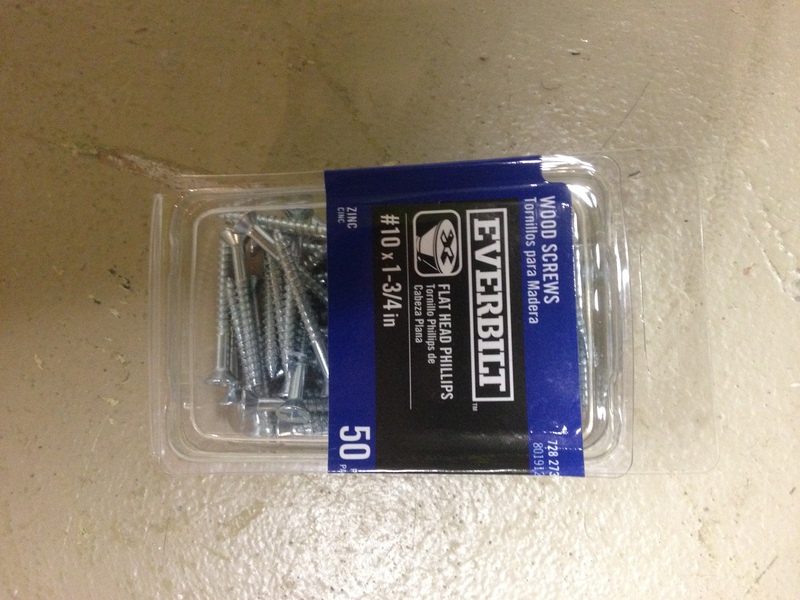 I bought a box of 50, and, in an act of over-engineering, used 25 screws to attach each end stop. 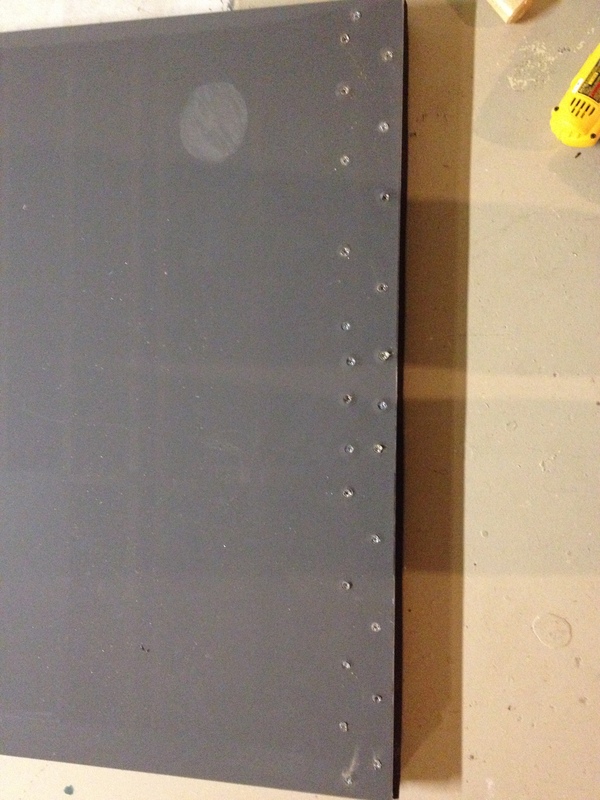 I staggered the screws an inch or two apart vertically and horizontally as shown in the pictures below. While working with my old slide board, I noticed that it had a tendency to slip on the floor when I pushed. 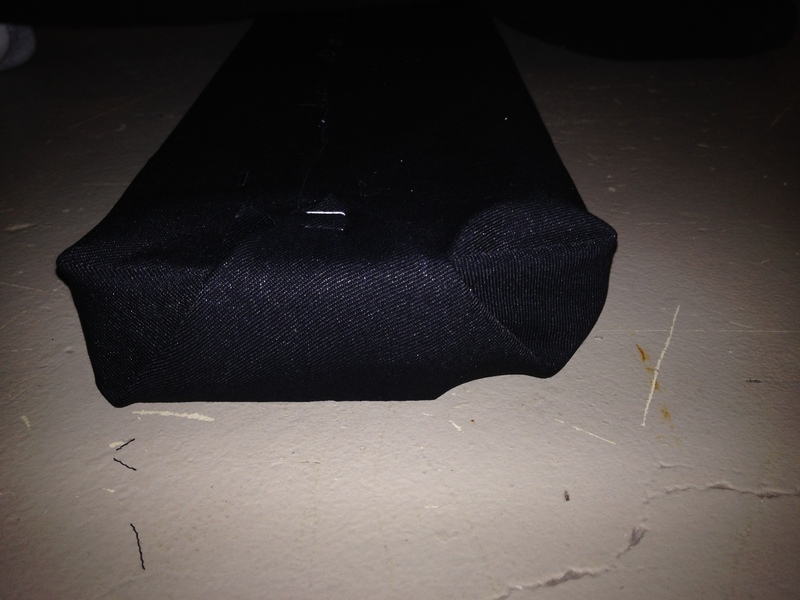 To correct that problem, I bought some shelf liner and put it on the floor under the board. This, generally, created more friction so that the board wouldn’t slide as much. 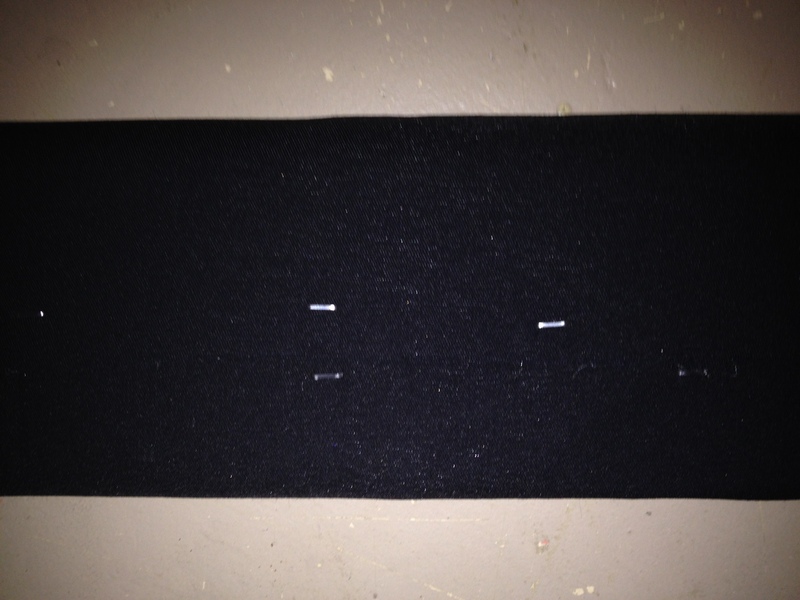 Theorizing that this could also be a problem with the new board because it would be placed on painted concrete and be heavier, I stapled the shelf liner to the bottom of the ends of the new board. They are evenly spaced at the middle of the board, and the board digs down into the liner during each push. So far, this seems to have prevented the board from sliding on the ground, but I do not know for certain whether it is the shelf liner, the weight of the board, or the floor surface that is preventing the board from sliding. It is nice to have a stable board. 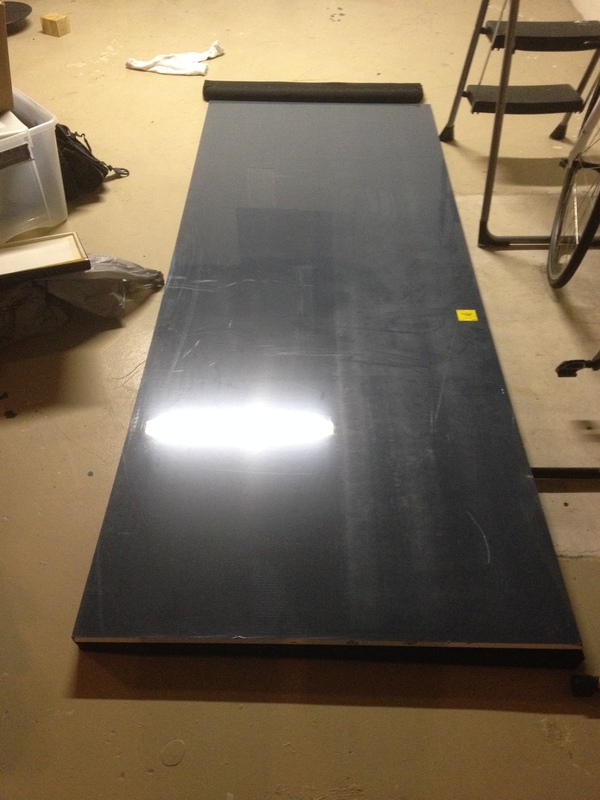 The completed board is 8 feet long, 3 feet wide, with an approximate 7 foot sliding surface from end-stop to end-stop. It probably weighs about 50 pounds, and is not portable with out a second set of hands and a large vehicle. 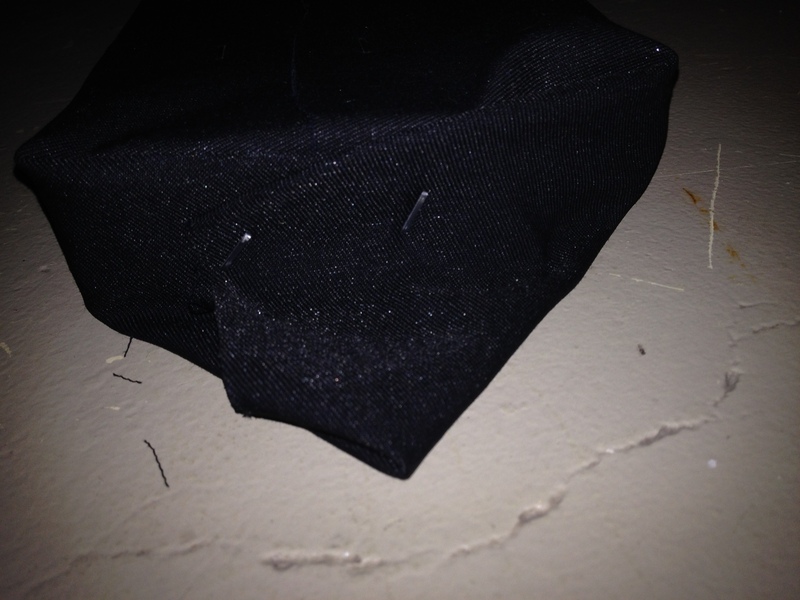 However, it does appear to be very durable. I waxed it with NuFinish Once a Year Car Polish and used the booties from my last slide board. The end product has a very nice sliding surface. I have to apply the car polish every other use, but the benefit in reduced friction is worth the extra care. You can also use Pledge furniture polish, though I haven’t tried it on this board. A friend of mine uses a silicone lubricant on his with good results, also. I will likely need replacement booties, though, because the ones I currently have aren’t very high quality and they have some holes that could end up causing my shoes to bind on the sliding surface. All in all, this project was far more economical and educational than spending $300 to $600 on a commercially manufactured product. At my current level, I probably don’t need a Pro-Slide or Ultraslide board, and, depending on how this board holds up, I may never need to make that kind of investment. However, if you are interested in purchasing rather than building, you can check out the 3G Slide Board, BlackHole’s Slide Board, the Hockey Train portable board, or a G1 Slide Board. Even with the commercially available options, I highly suggest building your own.